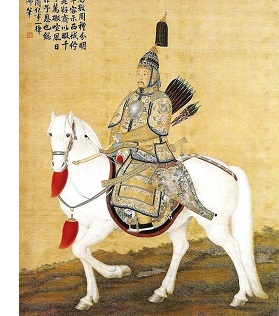 Kangxi Emperor (1654-1722) - The Qing Dynasty came to power in 1644 and would be the last imperial government of China. They were Manchu (as opposed to Han), an ethnic minority (from which the region of Manchuria is named). The fourth Qing ruler (but second to rule over China) was the Kangxi Emperor, who is best remembered for being the longest reigning emperor in China's history (from 1661-1722). But he also was an emperor of accomplishment. When he came to power, the Qing Dynasty was still young and China was still unstable. Twelve years into his reign an uprising broke out known as the Revolt of the Three Feudatories. The southern region of the country was more independent minded and did not like the idea of being ruled by a Manchu dynasty. In 1673, the three feudatories (former officials of the emperor) convinced a number of southern provinces to break away. Their goal was to restore the Ming Dynasty to power. In an interesting historical parallel, after their overthrow, Ming loyalists fled to Formosa (Taiwan) and established the Kingdom of Tungning (similar to what the Republic of China did after the Chinese Civil War). Tungning supported the uprising against the Qing. The Kangxi Emperor mustered the imperial army and dispatched it to the rebellious territories (but did not lead it personally). It took eight years to end the revolt, but the Qing government finally did so in 1681. In a magnanimous gesture, the emperor pardoned followers of the feudatories and allowed them to return to their homes. With the end of the revolt, Kangxi managed to consolidate power and unite all of China under a central authority. On the cultural front, he was responsible for the creation of the Kangxi Dictionary, which became the standard in China for the next two centuries. Christianity also enjoyed some of its greatest success in China under Kangxi. Jesuit priests served in his court and there is even speculation that the emperor himself converted to Catholicism. In 1692 he issued the Edict of Toleration which legalized Christianity and outlawed the persecution of its adherents.